Home to the revered Meenakshi Amman temple, Madurai city has a legacy of rich heritage and great historical past. Madurai, the oldest as well as the second largest city of Tamil Nadu, is also known as the ‘City of Nectar’. The erstwhile capital of the Pandyan rulers, Madurai is a historical and heritage town and is situated on the embankments of Vaigai River. Madurai is full of pilgrims, businessmen, rickshaw pullers and bullock carts. The city has been a center of learning and pilgrimage for the past many centuries. If you are visiting the southern parts of India, make sure to travel to Madurai to explore this beautiful city that is home to the well known Meenakshi Amman temple. The people of Madurai are hospitable, friendly and have deep respect for their values and traditions. Madurai city has seen a rich tradition of Carnatic music, a popular form of Indian classical music. M. S. Subbulakshmi, the stalwart of Carnatic music, was born in Madurai. Meenakshi Amman Temple is dedicated to Lord Shiva (Sundareswarar) and his consort, Meenakshi, with the lovely fish-shaped eyes. One of the most revered pilgrimages in South India, Meenakshi temple is an excellent example of Dravidian architecture and draws thousands of devotees everyday. Meenakshi temple has huge gopurams (a huge structure that adorns Indian temples gateway), which you can see from neighboring areas. Koodal Alagar Temple is an ancient shrine, dedicated to Lord Vishnu. The shrine has idol of Lord Vishnu in sitting, standing and reclining postures, one above the other. The beautifully carved ornate windows of the temple are famous as ‘miracles of the stone masons art’. There are also intricate woodcarvings adorning the temple, including a panel illustrating the pattabishekam (coronation) of Lord Rama. Vandiyur Kanmoy tourist complex is located at a distance of 6 km from the Periyar bus stand. An ideal picnic spot, it houses children's train, boating service and restaurant. Thirumalai Nayak Mahal is a magnificent palace, visited by hordes of people everyday. There is a massive Audience Hall inside the palace, which opens into a courtyard with elaborately ornamented arches. Another popular attraction of the palace is a daily sound and light show, which illustrates the story of Thirumalai Nayak and Silappathikaram (a Tamil Epic). Vandiyur Mariamman Teppakulam is a huge tank, fed by water brought from the Vaigai. The water is carried through an incredible system of underground channels. The tank also houses a Mandapam in the middle, which is dedicated to Lord Vigneshwara. In the month of January-February, a float festival is organized at Teppakulam. Gandhi Museum is situated inside a 300-year old palace. Dedicated to Mahatma Gandhi, this museum was set up to promote the teachings of Mahatma Gandhi. It houses the personal memorabilia of the Mahatma, along with a picture gallery, a library and an exhibition of South India handicrafts and village industries. The Government Museum also forms a part of this complex. 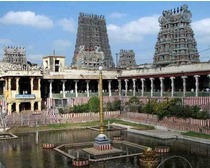 Thirupparankundram temple is located 8 km to the south of the Madurai junction. It is dedicated to Lord Subramanya and is one of the six abodes of the God spread throughout the country. As a popular tourist destination, Madurai boasts of various types of accommodation options for the visitors. There are some luxurious hotels in Madurai on the one hand and budget and economy hotels on the other. A good three star hotel will cost you around Rs 5000 whereas a cheap hotel in Madurai will come for Rs 1000- 1500. Some good national chains also have their hotels in Madurai. Madurai is well connected to other important neighboring cities of South India. Madurai airport has direct flights to Chennai/ Madras, Kozhikode/ Calicut, Pondicherry and Mumbai. Madurai railway station is connected with all the main cities in India by rail, via Chennai. A good road network connects Madurai with the other cities in South India.